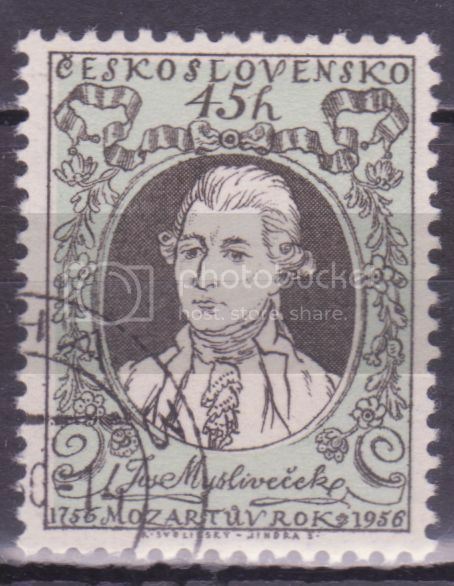 Another stamp (SG 930) from the 1956 Czech set for Mozart's birth bicentenary shows Josef Myslivecek (1737-1781), a Czech composer who wrote in most genres, including operas, symphonies, chamber music and concerti. He was a friend of both Wolfgang Amadeus Mozart and his father Leopold, and his music substantially influenced the younger Mozart's own compositions. He and the Mozarts parted company in 1778 after he had undertaken to arrange an opera commission from Naples for Wolfgang Amadeus Mozart but it never materialised. This stamp, SG 934, from the 1956 Czech set for Mozart's birth bicentenary, shows the Nostic Theatre in Prague, where Mozart's opera Don Giovanni had its premiere in 1787. 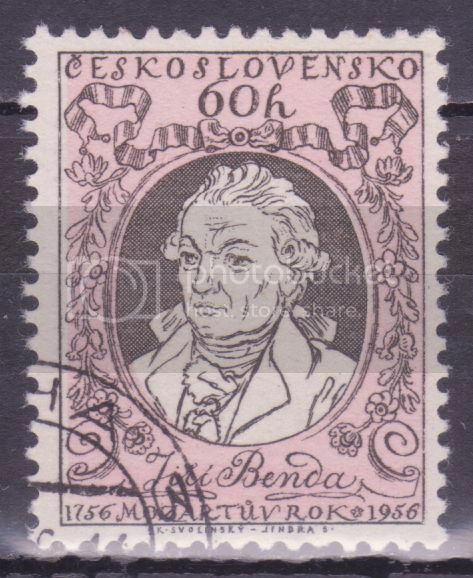 SG 931 from the 1956 Czech set for Mozart's birth bicentenary shows Jiri Antonin Benda (also known as Georg Anton Benda, 1722-1795), one of the chief Czech composers of the 18th century. His operas influenced Mozart. He also wrote symphonies and instrumental music. His was a musical family - three of his brothers were also composers, one of them, Franz Benda, being a major composer of symphonies, concerti and instrumental works. Schubert on an Austrian stamp of 1978 for the 150th anniversary of his death, SG 1822. Haydn on an Austrian stamp of 1982, when there was an exhibition in Vienna for the 250th anniversary of his birth. SG 1931. Emmerich Kalman (1882-1953) was a composer born in Hungary (then part of the Austro-Hungarian empire), who started off by composing more serious music. He found fame when he turned to operettas, and, inevitably, was drawn to Vienna. His light operas were also staged in New York and other cities around the world, and several of them were turned into films. Some incorporate jazz. One or two have unlikely titles, like The Duchess of Chicago. Although he was of Jewish origin, his music was admired by Hitler who even offered to make him an honorary Aryan - an offer he refused, fleeing to Paris and then the USA. His works were then banned by the Nazis. He returned to Vienna in 1949, and moved two years later to Paris, where he died. The composer Grieg on a Norwegian Europa stamp of 1983, SG 916. In the background is part of the score of one of his most famous works, his piano concerto. 1986 was the centenary of the death of Liszt, and Germany issued a stamp for the occasion, SG 2135. Liszt was in part the model for the Polish musician Will Ladislaw in George Eliot's masterpiece Middlemarch. 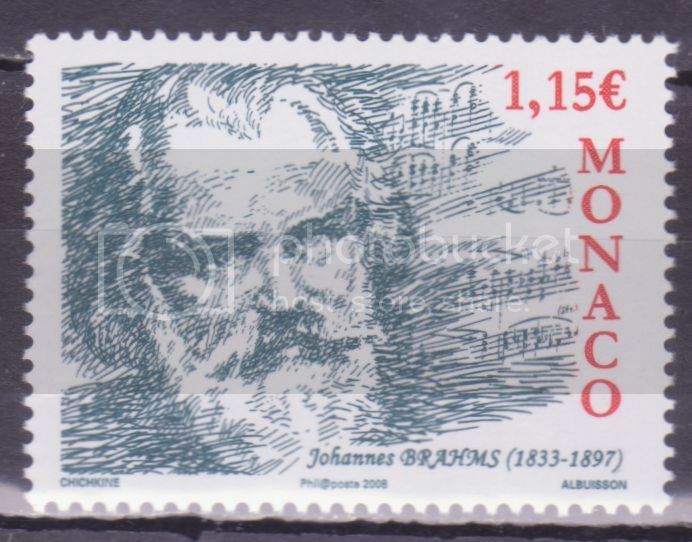 In 2008 Monaco issued a stamp, SG 2828, to mark the 175th anniversary of the birth of Brahms. Think of opera, think of tenors singing their hearts out, think of Giacomo Puccini (1858-1924). 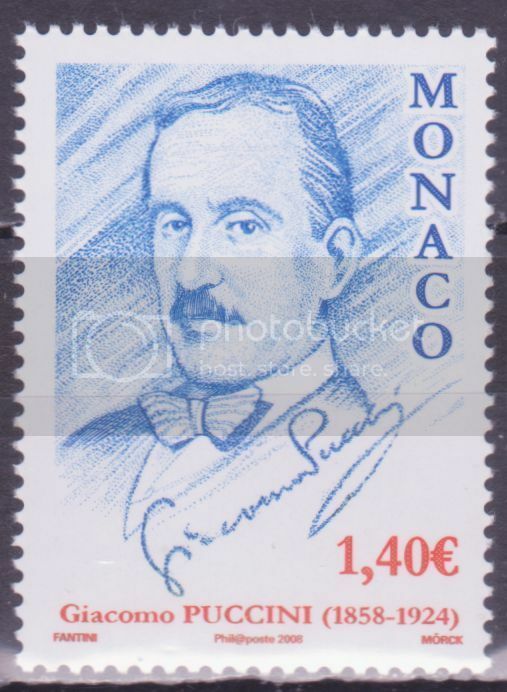 Here is a Monaco stamp, SG 2818, officially for the 150th anniversary of his birth in 2008, but issued in late 2007. Liszt on a Luxemburg stamps of 1976, SG 984. Liszt seems to be one of the most popular composers for stamp designers - perhaps because there are a number of surviving portraits of him and he always looks imposing! François Couperin (1668-1733) was one of the major French Baroque composers. He came from a family of musicians, and was appointed court organist in 1717. Many of his compositions were short pieces written for harpsichord, often with picturesque titles, and some were orchestrated by Richard Strauss. His works were admired by Johann Sebastian Bach, and also by Ravel, who wrote the piano suite Le Tombeau de Couperin (The Memorial to Couperin) as a tribute to him. As with much Baroque music, dance rhythms often underlie Couperin's music. Couperin features on a Red Cross Fund semi-postal stamp of France, SG 1782 of 1968. Beethoven on a French 1963 stamp, SG 1611. Gabriel Fauré (1845-1924) is best known for two works - his much-performed Requiem (I have sung bass or tenor in this a number of times) and his Pavane. SG 1795 of 1966. Guillaume de Machaut (born about 1300, died in 1377) was a French poet and composer who wrote songs of courtly (idealised) love, and the Mass of Notre Dame, the first complete setting of the Latin Mass which can be safely attributed to a single composer and which is one of the masterpieces of medieval religious music. He was a secretary to John I, king of Bohemia from 1323 to 1346, and, after John's death in the battle of Crecy, entered the service of various other aristocrats. (John lost his sight during a crusade ten years before his death, but that did not stop him being one of the French commanders at Crecy.) SG 2205 of 1977. Francis Poulenc (1899-1963) composed works in most genres. His best-known include some pieces for solo piano, a ballet called Les Biches ("biche", literally a doe, was slang for a coquettish woman), a musical version of children stories about Babar the Elephant, and a joyous setting of the Gloria from the Latin Mass. Much of his music is witty, but he was also capable of writing music in a more serious vein. SG 2028 of 1974. Jacques Offenbach (1819-1880) composed almost 100 light operas, often poking witty fun at the pretensions of the French Second Empire of Napoleon III. Among his best-known works are Orphée aux Enfers (Orpheus in the Underworld) with its famous cancan, La belle Hélène (The Beautiful Helen [of Troy]), and La Vie Parisienne (Parisian Life). He also wrote a more serious opera, The Tales of Hoffman. SG 2395 of 1981. Camille Saint-Saens (1835-1921) on a French National Relief Fund stamp of 1952, SG 1153. His best-known works are Danse Macabre, Carnival of the Animals, the opera Samson et Delilah, and his third ("organ") symphony where the last movement includes some powerful passages for the pipe organ. If you know anything about French Baroque composers, the two composers likely to spring to your mind are Couperin and Rameau (1683-1764). Rameau came to fame for harpsichord music and then at the age of 50 started composing operas. In recent decades his operas have been successfully revived - earlier, just a few dances from them were in the general repertoire. (Dance interludes were a standard element of French operas of the period.) As a man he had a reputation for being solitary, brusque, irritable, over-conscious of his own musical worth, and excessively thrifty - even when he was well-off in later life, he had only one pair of shoes and wore shabby, well-used clothes. But he was generous to relations. Here he is on France SG 1174 of 1953, one of a set of National Relief Fund stamps.